* 3Jn 1:5: Vulgate: “fideliter facis quicquid operaris in fratres et hoc in peregrinos”. Also quoted by the Archbishop of York William VII. Dawes on p. 468. I wrote this to the noble and eminent Mr. Ferenc Pápai as a token of the reverence of my soul towards him. 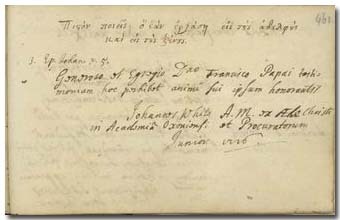 His note is dated in 1716 in Oxford, and according to this he was magister and procurator of Christ Church. He is probably identical with (1) that “John White, Anglus, 22, Juris studiosus”, who immatriculated on September 7, 1719 at the faculty of law in Leiden. – He can be eventually also identical with (2) the pastor John White (died around 1760), or (3) a certain John White, fellow of St John's College in Cambridge who has many works in the catalogue of the British Museum. Perhaps further investigation will decide which person out of the three wrote in the album of Pápai Páriz.